We ‘re not your average jewelry store, nor is the value that we place on your personal information and privacy just average. Mucklow’s Fine Jewelry does not share, rent, or sell personally identifiable information about individuals collected on the website to other individuals, corporations, or organizations. If you do share your personal information (email address, phone number, address or any other personally identifiable information) with us it is held in confidence. Mucklow’s Fine Jewelry may use this information to improve our site, products and services by contacting you through the information given. For instance, we may contact you for promotions, new product or service surveys, and contests. Our goal is to provide you with the relevant information you need to make an informed jewelry purchase. Of important note: If you chose to participate in any contest, your information may be shared with other vendor partners in the contest. We would like to provide you with the latest information on our new products, promotions and services. With that being said, we are mindful of the electronic spamming that has become a part of our everyday life. Our goal has always been to inform our clients when it is appropriate, relevant, and worthy of their time. We do not condone spamming practices. To be taken off our email marketing: Please click on the unsubscribe link in the email. In addition, you may at any time, contact us at Mucklow’s Fine Jewelry, 1103 Crosstown Court, Peachtree City, GA 30269 or by telephone at 770-486-3400 or through our “Contact Us” email page. 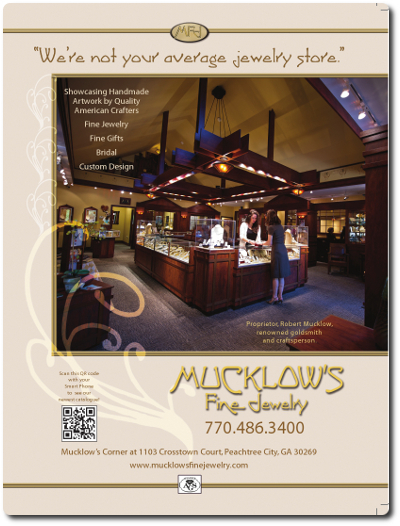 To change your email marketing information: To complete the information we have for you or to change it, please contact us at Mucklow’s Fine Jewelry, 1103 Crosstown Court, Peachtree City, GA 30269 or by telephone at 770-486-3400 or through our “Contact Us” email page. We will correct or update any information as soon as possible. The Children’s Online Privacy Protection Act: April 21, 2000 the Children’s Online Privacy Protection Act became law. This important Act pertains to websites directed toward children under 13 years of age. The Mucklow’s Fine Jewelry website is not directed towards, nor for the use of, children under the age of 18. We do not intentionally or knowingly collect information on or from any person under 18 years. Should we discover or be informed that a child has registered for any of our products or services or used another child’s personal details to register for our products or services, we will delete such information from our records. Parental Control. In the event that a parent or legal guardian believes that their child has registered for any of our products or services please contact us at Mucklow’s Fine Jewelry, 1103 Crosstown Court, Peachtree City, GA 30269 or by telephone at 770-486-3400 or through our “Contact Us” email page. We encourage guardians to visit the FTC’s website at www.ftc.gov for information on protecting children’s privacy on the World Wide Web. Our website is linked to other websites that Mucklow’s Fine Jewelry is associated with in the jewelry industry. You are encouraged to review their policies as they may not be the same as ours.